Send your kids on a musical journey to a place where everybody loves to sing, dance, and learn about God's love! Featuring real kids' voices, this delightful CD, based on the books of the Bible, is filled with postive, uplifting songs even parents will love. 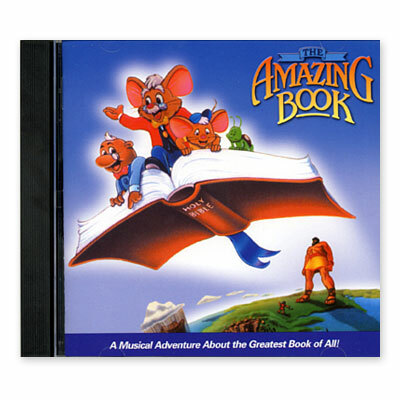 If you want to listen to music that will help your children remember all the books of the Bible, then listen to The Amazing Book CD! The track listing is as follows: "The Amazing Book," "The Good Book," "The Writers Of The Bible," "The Divine Library," "Sixty-Six Books," "A Story-telling Book," "The Amazing Book "(Reprise), "Through History," "Believe It Or Not," "His Story," "Bible Medley," "Letter Of Love," "The Amazing Book." Printed lyrics are also included with the CD. Designed for children ages 2-10, these songs are based on some of the history and values of the Bible, and are fun for your child to sing along to. By listening to these stories, you child learns more about the world's most important book—the Bible. This entertaining, music CD is ideal for trips in the car or homeschool use, so take a break from your day and listen to this positive, Christian CD! Create long-lasting memories with your child. Order The Amazing Book CD from Alpha Omega Publications today!